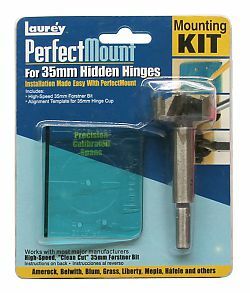 The Laurey Perfect Mount Template is an alignment template designed to make easy installation of European concealed hinges. Kit includes high-speed 35mm forstner bit and alignment template. Works with most major European concealed hinge manufactures such as Salice, Mepla, Grass & Blum. Not for use on the Salice Excenthree Face-Frame Hinge or Salice Mini Hinges. Note: Not recommended for use on hardwoods such as Oak, Cherry, Hickory, or Maple.